Seokheun “Sean” Choi and two of his students developed the device, a microbial fuel cell that runs on the bacteria available in a few drops of dirty water. They report on their invention in a new paper published online in the journal Biosensors and Bioelectronics. 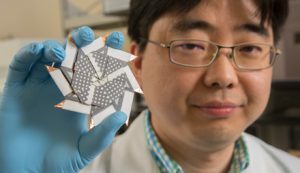 choi_origamiChoi previously developed a paper-based origami battery. The first design, shaped like a matchbook, stacked four modules together. The ninja star version, which measures about 2.5 inches wide, boasts increased power and voltage, with eight small batteries connected in series. The new design folds into a star with one inlet at its center and the electrical contacts at the points of each side. After a few drops of dirty water are placed into the inlet, the device can be opened into a Frisbee-like ring to allow each of the eight fuel cells to work. Each module is a sandwich of five functional layers with its own anode, proton exchange membrane and air-cathode. Choi’s original matchbook-sized battery could be produced for about 5 cents. The new ninja star device is more expensive — roughly 70 cents — in part because it uses not only filter paper but also carbon cloth for the anode as well as copper tape. The team’s next goal is to produce a fully paper-based device that has the power density of the new design and a lower price tag. Choi prides himself on involving students in his research, and this paper represents a special triumph for co-author Landen Kwan, who worked on the project during a National Science Foundation Research Experiences for Undergraduates program at Binghamton in the summer of 2015. Kwan, then a student at Queensborough Community College, is now enrolled at Stony Brook University. Binghamton doctoral student Arwa Fraiwan also contributed to the study, which was funded by the National Science Foundation.